I was newly-minted fourteen years old when I heard those words while sitting in a funeral home in Everett, MA – the town where I began my grade school but quickly retreated from alongside my family for the bucolic small-town splendor of the South Shore communities. Our sudden exodus came at the tender age of six. Although I had been gone a full eight years, we always came back. Holidays. Cookouts. The typical family fare that beckons everyone back to the nest. Everett was where my Dad had settled with his family – after my Grandpa Ned and Nana Pearl had picked up their Canadian roots and decided to head South – the plan apparently being to just keep driving until they hit water. That would explain how they came to relocate from Newfoundland to the Florida coast. Yes – I know Newfies are sea-faring people but just go with me on this one. It’s worth a little poetic license. A few years in that hot Florida sun – and key lime acting as a poor man’s substitute for seal flipper pie, my Grandpa picked up roots again and decided to head North. Apparently the gas gave out somewhere ’round Mystic River – as they settled in to a home in Everett and made long-term family ties that bind the Humphries family to the North Shore to this very day. I lived in that city until I was six. One Summer afternoon – as my sister Jenna and I were playing in our front yard, my Mom received a dire phone call. Apparently, a shooting had taken place a block or two away and a manhunt was on the make. Panicked, she grabbed us by the shirt collars, safely squirreled us away behind the dead-bolt and feverishly dialed my father at his job for the New England Telephone company. By the weekend, we were looking to trade our mean streets for green ones. That’s how I came to move from Everett to Rockland before the start of First Grade. And that’s why I only returned to Everett when the family business beckoned. Which explains why I found myself – at fourteen – sitting in the family room in that Everett funeral parlor with my Uncle Bill by my side. A long time fire fighter for the city – he was (and is) a real man’s man. That said, he had a gentle demeanor – especially when it came to kids. He liked to tease and toy with us and get us to laugh. He is my godfather and I was his first nephew. That type of relationship almost always forms a bond. Had I not lived so far away, I’d have liked to have seen him more. But whenever I did, he always made me laugh and in later years, when I grew more confident in my personality, I aimed to repay the favor – usually with much success. But on that day, as we gathered to say goodbye to my beloved Grandpa Ned – who died suddenly but peacefully in his sleep of a heart attack – laughter was in short supply – at least from my perspective. I’ve been to enough funerals to have seen most everything. I’ve said goodbye to a peer – exactly my age and station in life – and just been completely crushed. I’ve also seen long lives celebrated with real knee-slapping hysterics; the best way to remember a life and certainly the way I want to go no matter when that day may come – young or old. I’m telling ya’, there better be laughs or I’ll haunt every last one of you. Maybe it’s because I was seeing everything from Fourteen – when the world is more about you than anyone else – but I don’t remember a lot of laughs that day. That might have something to do with some slightly simmering family turmoil. I’ll get to that in a minute but take it all with a grain of salt. That’s just me spit-balling. After all – I was just fourteen. What the hell did I know? I do know that when my Uncle looked over at me; and with real love and compassion in his voice imparted those four simple words, it just slayed me. Before then, I didn’t cry. In fact, I couldn’t figure out why I hadn’t cried. After all – I LOVED MY GRANDPA!!! Seriously loved him. Loved seeing him. Loved spending time with him. Loved making him laugh. A Canadian, he clung fiercely to the traditions of his homeland. He would often start weekend mornings by cooking up some kaplan – this awfully slippery fish that he would fry like bacon and stink up the whole place. He would roar with laughter when recounting the time I rose my sleepy-little head from bed, at the age of five or six, burst into the kitchen and declared his cooking had broken my nose. He lived to tell that tale. In equal measure, he would get great mileage out of scaring the hell out of me with little pranks – alongside his partner-in-crime, his daughter, my Aunt Suzanne. One day, while vacationing down the Cape, they spied a construction vehicle looming closer and closer to our parked car. He and my Aunt decided to weave a tall tale that the truck was coming to get me. By the time my Nana Pearl returned to the car with groceries in hand, I was balling and the two of them were roaring. “NOW WHAT DID YOU TWO DO TO HIM?”, she admonished. And that just made me cry more – and them laugh harder. But there were more laughs than tears and always stories that sprung from it all. Laughter, tears and stories. In the end, that’s really what we remember most. I needed that. More than ever. See, fourteen had started low and only gone down hill from there. At the age of fourteen, my parents divorced. I remember attending a holiday dinner at my grandparents’ house; with my Dad and sisters in attendance but not my Mom (as the news had already broken even if everything wasn’t officially in the books yet) and something said at the table set my Dad and Grandpa off. Nana Pearl quickly silenced it but at fourteen, it’s easy to read between the lines. This impending divorce did not sit well with my Grandpa. He loved my Mom. Obviously loved my Dad – his son. And I think those first seismic tremors that emanate from such a world-changing event unhinged him a bit. A quiet man on most days, he didn’t show his anger too often – and in front of me, I’d testify – never! But this news saddened him. And that, in turn, set him off. It worked at him more than it did me. And I had a front-row seat to the event. Even though I understood his pain, I felt this decision was the right thing for our family. While I loved my Mom and Dad – their divorce was necessary. There was just too much stress and turmoil working them apart and I spent way too many nights trying to bury my head under a pillow to silence their debates. I can recall crying myself to sleep – at the advanced ages of twelve and thirteen – and getting pissed about everything. Pissed that we had money troubles. Pissed that they seemed to always argue about EVERYTHING!!! Pissed that I was crying in the first place. I was a 13-year old boy. Boys don’t cry. At least, that’s what we told ourselves way back when. It’s only now that it seems so foolish to hold it all in. It’s a good thing that I couldn’t help myself. I’d lay there and just wish everything would get better. And crying sort of made it so. My Mom and Dad were (and are) two great people. Always good to me and my sisters. Always so loving and caring – to this very day. They just had drifted apart. And something needed to change. They needed to be happy. And when that change came – at fourteen – I actually felt relieved. Surprisingly so. For starters, I was at the age where I could comprehend it all and make sense of it. I knew they would continue to take care of us – and I knew they would always love us. I knew this had nothing to do with us – not me nor my sisters – even if I’m sure we weighed heavily on the decision. I knew that things would and could only get better. And they did. And today, both are happily re-married and our family – and that of my children – benefits from so much blessed expansion. My kids live a life full of love – and their many grandparents help foster that environment daily. Still – I was fourteen – and it was hard for a period there to not feel as if walls were crumbling. My beloved Grandpa had died and my immediate family had split apart. On top of all that, I was nearing the end of my Freshman Year in High School. I remember my mind wandering in classes – as my typical As became Bs (and later some Cs) – and I just became obsessed that everyone was going to ostracize me. I thought if I kept the news of their divorce a secret, I’d be fine – but the second it got out, I would be what every fourteen year-old dreads most. And then, completely out of the blue, I told a friend who looked at me and replied: “Yeah… So…” And that’s all the encouragement I needed. His ‘without skipping a beat’ reply, “OK – So with that off your chest, can I borrow your Super Mario Brothers or what?” was the pitch-perfect reaction that I needed to experience. Big changes were occurring in some facets of my life but it did nothing to diminish or alter my other relationships. Life would go on. Where I stand now – with the big 4-0 looming, ‘The Monkeybar Mafia’ set for its World Premiere six months from now, and some other stuff coming down the pike, I have a feeling that Forty will be a year I’ll long remember. 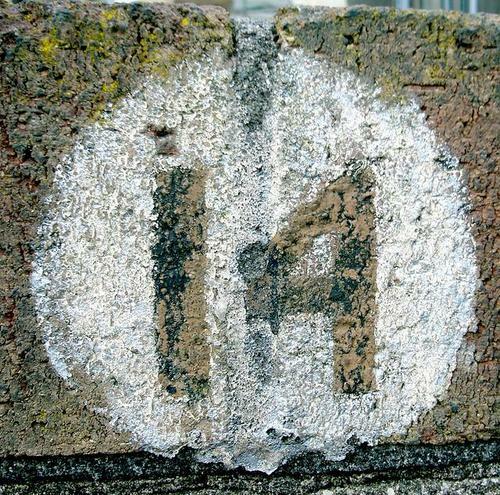 That said, no matter what tidings my future may hold, ‘Fourteen’ will always loom large in memory. It taught me a lot about myself. As always, an excellent piece and very touching.. Thanks Dan! Wait ’til I get around to telling all about our Papa’s days. Well another guy with Boston area roots makes good in Rock Vegas:) Great read and can realte to the Grandpa story quite well. Touching as it brought him instantly back to mind today -especially after a trying day at work. Now everything is back in perspective. Appreciate the jolt back to what really matters. This was one of my favorite postings from you. So often, we brush off the impact events have on children. We assume they oblivous to what is going on. It reminds me to think about how events in our home or even events they overhear on the news can impact them. Thanks, Ed! Eddie, I’ve read this post several times now always through tear filled eyes. I lovingly remember those years of you staying over on school breaks and yes I remember the broken nose incident as well. I often wish my son David had gotten the chance to meet my Dad, your grandpa. I know dad would have loved David just as much as he cherished you. I tell David all the time that I wish he could have known his Grandpa as you knew him. My father was not a perfect man by any means but he was a great father who always made me feel special. While away at college he wrote to me faithfully every two weeks and always enclosed a check. Every Christmas he bought only two gifts, one for my mother and one for me. And even though he swore he never wanted to ever travel south again after Florida he came to visit me once when I lived in Texas. My father instilled in me the importance of earning an honest living and the joy of making people laugh. Thanks for sharing your memories of him. And as for the post, I’m glad you liked it. Those visits created such great, undying memories in me. Made me who I am today. And you are a huge part of that!! !